yet in on The Flash), an up-and-coming genre looked pretty attractive. Two sci-fi heroes came out of a 1957 editorial conference — Space Ranger and Adam Strange. They were assigned two successive runs in Showcase, the comic book where new concepts were tried before committing the publisher's capital to a full-scale title launch. Editor Jack Schiff took Space Ranger, while Julius Schwartz took Adam Strange. Schwartz assigned his character to writer Gardner Fox (creator of The Flash and Hawkman) for development, and artist Mike Sekowsky (later known for unusual versions of Wonder Woman and Supergirl). Adam debuted in Showcase #17 (Nov-Dec 1958). Two of his three try-out issues bore the title "Adventures on Other Worlds". The third cut to the chase, and used Adam's name as the headline. In the best tradition of pulpish sci-fi, Adam promptly fell in love with a local beauty named Alanna. Also in that tradition, he had to subdue a menace to her entire planet before he got kissed. In a twist of his own, however, the Zeta Beam chose that moment to wear off. Fading back to Earth, he had to wait for the next one (fortunately, he had a schedule) to get his reward — but by that time (i.e., next issue) there was a fresh menace for him to contend with. Adam was pretty well received by readers, but not well enough received to move into his own comic. Instead, he got a berth in Mystery in Space, a science fiction comic Schwartz had edited since its beginning, in 1951. That title had hitherto run a few minor continuing characters, such as Knights of the Galaxy, Interplanetary Insurance, Inc. and Space Cabby, but had mostly featured non-series stories. 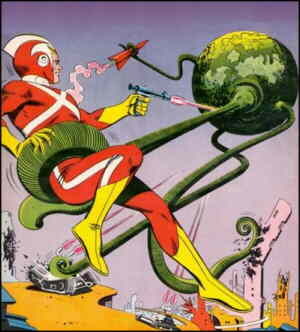 Adam Strange became its main star and cover feature with the 53rd issue (August, 1959) and remained unchallenged in that position until Hawkman joined him in #87 (November, 1963). Sekowsky left the series, and the artist most associated with Adam Strange came aboard — Carmine Infantino, whose prior credits range from Black Canary to Pow Wow Smith. A high point of the series occurred in #75 (May, 1962), when Adam fought Kanjar-Ro, a space invader who had earlier been defeated by The Justice League of America. Sure enough, the JLA itself turned up in that issue, and were so impressed with Adam's performance that they offered him membership — giving him an opportunity to be the very first to turn down such an offer (an option later exercised by Metamorpho and Black Lightning). In 1964, following a shake-up among DC's editors, Hawkman moved out into his own comic and his slot was taken by Space Ranger — bringing the two characters created in that 1957 editorial conference together in the same book. At the same time, veteran comics artist Lee Elias (Beyond Mars, Green Arrow) became Adam's illustrator. But the new look didn't last. In the 103rd issue (November, 1965), Ultra the Multi-Alien, who is best remembered for his goofy concept, ousted them both. Mystery in Space itself ended with #110 (September, 1966), and Ultra, too, was homeless. Since then, Adam has been seen from time to time in guest appearances, mini-series and the like. He eventually overcame his problem with Zeta Beams wearing off, and settled on Rann full-time. Needless to say, he married Alanna. The menaces thinned out, so he got to enjoy a moment of wedded bliss now and again. In the late 1980s, when "darker" visions began to dominate comics, Adam's back-story underwent some revision. In a guest appearance in Swamp Thing, writer Alan Moore (The Ballad of Halo Jones, V for Vendetta) invented a new past for him, one in which the people of Rann were slowly dying out due to declining fertility, and the actual intent of the Zeta Beam was to bring Adam to them as a breeding stud. This retcon was confirmed in a 1990 mini-series, which also took the trouble to kill off Alanna. Adam returned to Earth, got a new girlfriend, and took the attitude that Rann can jolly well save itself from those ever-recurring menaces. More recently, he was returned to his status as a familiar, marketable character. Alanna was de-killed, they have a daughter now, and the Rannians are too busy dealing with a bunch of immigrants from Hawkman's planet, to worry about mixing a pile of inferior Earth DNA in with their gene pool. Text ©2000-09 Donald D. Markstein. Art © DC Comics.